Match your company identity and spice up the atmosphere in your facility. The Sign Brothers offers an incredible variety of interior signage options. 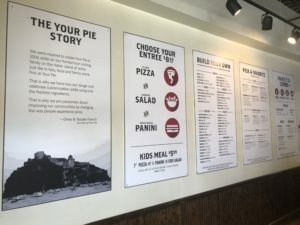 Interior signage can be constructed from a larger variety of materials than exterior signage since it doesn’t have to stand up to the wear and tear of direct sunlight and moisture. Acrylic, PVC, and polystyrene are a few of the many materials that work especially well for interior signage. Our project managers and team of experienced in-house designers can help you conceptualize and create interior signage that strengthens your brand identity, and improves the aesthetic of your building. We are extremely familiar with the ADA (Americans with Disabilities Act) and can help you create interior wayfinding signs that strictly comply with ADA’s regulations without compromising design.